Spring in Japan means sakura (桜) or cherry blossoms and sakura-flavored food and drinks. A tell-tale sign that spring is soon on the way is when cherry blossoms start appearing on food and drinks in Japan. Early to mid-February is usually the time when sakura flavoured food and drink starts rolling out and hitting the supermarket and convenience store shelves and refrigerators. You can find many different kinds of food and drinks containing sakura at this time of the year in Japan. Some of my favourites are the sakura drinks from Starbucks Japan, and sakura mochi (桜餅). A new sakura product recently caught my eye, so I just had to share it with you all. Sakura flavoured yoghurt. We picked up this four-pack of yoghurt from our local AEON supermarket with its pretty cherry blossom design. Not only does it look like spring, it tastes like spring as well with its sakura flavour. 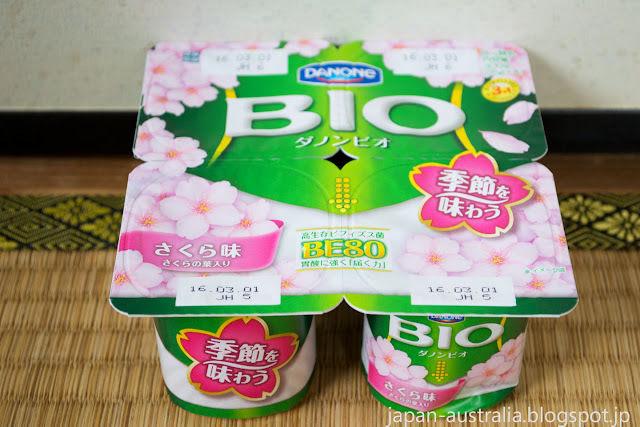 The yoghurt contains cherry blossom leaves and is a pale pink colour. Sakura petals and leaves are a seasonal ingredient used in a variety of Japanese foods, desserts and drinks. How does it taste? Really good! It has a light cherry flavour and the cherry blossom leaves give it a nice saltiness. 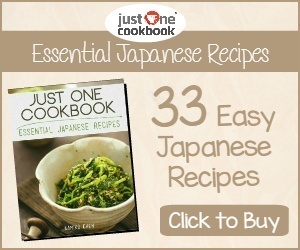 Check it out if you are in Japan and want an early taste of spring.